Mixpanel, an analytics service that tracks “actions, not pageviews” bought a billboard to make the point that the pageview is not the right way to measure what’s going on on the web — engagement is. They gave a great interview to TheNextWeb. This is important because advertising is most frequently measured and priced in pageviews (or clicks, which isn’t better), and advertising is the lifeblood of the internet. From a web service’s perspective, what you want to measure isn’t just how many people use your service (and even that is different from pageviews, and tricky), but how they use it, and indeed whether they use it. From an advertiser’s perspective, we would argue that whether someone actually engages with an ad is much more important than whether they see them (although that matters too). Another interesting startup in this space is VideoEgg, which makes immersive interactive ads and charges a CPE (cost per engagement, as opposed to CPM, cost per thousand impressions) based on whether people interact with the ad. 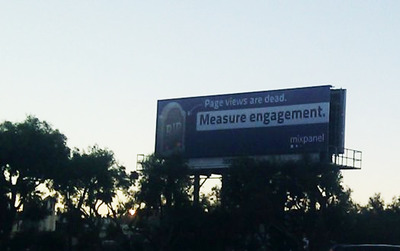 The problem, of course, is that “engagement” is a much more slippery metric than straight pageviews. Another problem is simply that advertisers and agencies are set in their ways and adverse to change. But that creates opportunities for ambitious startup.